We highly recommend you try this tomato-based BBQ sauce (thats is both delightfully sweet and deliciously hot) on pork, chicken, and beef. If you have your own special recommendations. Let us know! Our House Rockfish & Flounder Seafood Marinade is a gourmet's delight! This all natural seafood marinade is delicious on rockfish (striped bass), flounder, swordfish, halibut, chilean sea bass, or any whitefish. Whether you choose to grill or bake your fish, marinate for 20 - 40 minutes and follow the directions on the bottle. Want to put a spin on your favorite veggies? House Rockfish & Flounder Seafood Marinade is awesome as a marinade for raw veggies. Let us know what you think! House Rockfish & Flounder Seafood Marinade sold by the case (12 bottles / 12 oz. each) or visit our visit our Sample Pack page for more options. House Seafood Lemon Dill Marinade & Sauce A Hit From The Start! The House Seafood Lemon Dill Marinade & Sauce joined our House Seafood Family in 2010, making an already successful line of products better. Lemon and Dill make a great pair, especially when the lemon and dill are well-balanced like they are in this creamy marinade. Our suggestion for this marinade? Marinate: Place your salmon filets in a large ziplock bag and pour as much, are as little, marinade in the bag, making sure each filet is well coated. Then refrigerate for 20 minutes. To Grill: brush grill rack with oil. Remove salmon from marinade; discard marinade. Place skin side down on grill over medium heat. Cover grill; cook 10 to 15 minutes or until salmon flakes easily with fork. Other options include baking, baking in foil or roasting your salmon. House Seafood Sweet & Spicy just like the doctor ordered! An awesome marinade for tuna steaks, salmon, swordfish and chilean sea bass. 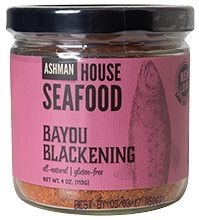 Ashman House Seafood Sesame Teriyaki Marinade & Sauce is a real treat! House Seafood Apricot Maple Marinade brings the sweet! This product is excellent on fish fillets, shrimp and scallops. House Seafood Japanese Style Marinade & Sauce is far different from any marinade/sauce you've ever tried! This product is excellent on fish fillets, shrimp and scallops and steaks. House Seafood Jamaican Jerk Marinade & Sauce just might be the biggest Jerk you've ever met! one of a kind - perfect for fish fillets, shrimp and scallops. Remoulade was originally a french staple used on meat, but has become a staple sauce among many Americans. Our Remoulade is excellent on all seafood but a great accompaniment to pan-fried breaded fish fillets. We'd love to hear how you enjoy this sauce! Our House Salmon Bourbon Teriyaki Marinade & Sauce is Absolutely Awesome! One of our BEST SELLING marinades, the Bourbon Teriyaki is sure to please your taste buds! Combining bourbon and teriyaki is something that Ashman Manufacturing does very well. This product is excellent on salmon, tuna, as well as all kinds of fish fillets, shrimp and scallops. Try it on your poultry and meat as well. Our House Salmon Bourbon Teriyaki Marinade & Sauce is sold by the case (12 bottles / 12 oz. each) or visit our visit our Sample Pack page for more options. House Shrimp Scampi Marinade & Sauce is excellent on fish fillets, shrimp and scallops. House Salmon Citrus Wasabi Marinade & Sauce is a Best Seller! House Salmon Citrus Wasabi Marinade & Sauce has an amazing blend of citrus and wasabi that will please your pallet. This marinade brings a sweet tangy sensation with a delayed hint of heat. Use it as a marinade for fish filets, a finishing sauce or drizzle it on at the end of pan searing your fish! We sell this item by the case (12 bottles) or visit our Sample Pack page for more options. House Salmon Honey Ginger Marinade & Sauce is a Marinade that the entire family will enjoy! Our House Salmon Honey Ginger Marinade & Sauce will give your fish a sweet taste that your entire family will enjoy. The evenly matched honey and ginger makes this marinade well-balanced. Use it as a marinade for fish filets, a finishing sauce or drizzle it on at the end of pan searing your fish! Bake, Sear, Roast, Grill, Broil - you will LOVE our House Salmon Honey Ginger Marinade & Sauce because it is as good, as the day is long. Our House Seafood Cocktail Sauce is EXCEPTIONAL! House Seafood Pineapple Teriyaki Marinade & Sauce - a recent addition. House Seafood Wasabi Teriyaki Marinade & Sauce is one of our new marinades. House Seafood Wasabi Teriyaki Marinade & Sauce joined the family in late 2015 and has already made a name for it's self. This product is excellent on fish fillets, shrimp and scallops. And why not try it on Pork, Chicken and more!Try our House Seafood Wasabi Teriyaki Marinade & Sauce today!We sell it by the case, 12/12oz bottles or you can visit our Sample Pack page for more options. House Seafood Ginger Plum Marinade & Sauce is a go to sauce! Just the thought of Ginger & Plum together, makes my mouth water! Obviously awesome on fish, but what if you drizzled this sauce on stir fry with chicken or pork? The sky is the limit! One of our NEWEST marinades in the House Seafood line. If you love the flavor of Chipotle and the zest of Lime, than try this product today! You will not be disappointed. Awesome on Seafood of all sorts, but goes well with Chicken & Pork! All you need now is the fresh cilantro and tortilla chips!